CR Rao AIMSCS Statistics Olympiad 2018 Apply Online, Admit Cards at www.crraoaimscs.org: CR Rao AIMSCS Statistics Olympiad 2018 is a talent search Maths Statistics competition, 10th Statistics Olympiad 2018 Exam Date, Statistics Olympiad Admit Cards. AIMSCS: CR Rao Advanced Institute of Mathematics, Statistics and Computer Science. With a view to spotting Statistical talent at an early stage, C.R. Rao AIMSCS, takes pleasure in conducting: “The Tenth Statistics Olympiad 2018”, a talent search competition in Mathematics and Statistics for students of High Schools and Junior Colleges. The Statistics Olympiad competition will be in the form of a written examination of three hours duration. It will be held on Sunday the 28th January 2018 between 9.30 a.m and 12.30p.m in Hyderabad, Warangal, Khammam, Visakhapatnam, Vijayawada, Tirupathi, Guntur, Kakinada, Mumbai, Pune, Aurangabad, Nagpur, Chennai, Bangalore, Delhi and SriLanka centers. The CRRao Educational Institution (AIIMS) in Hyderabad will be conducting the tenth statistics Olympiad examination across the country on January 28. The Olympiad to extract and encourage students' talent in mathematics and statistics. At present, students of the 9th and 10th class will be examined as senior level and the candidates of intermediate and secondary year will be examined as junior level. The deadline is January 8 to apply online, and it will be conducted from 9.30 am to 12.30 pm on January 28. Telangana has centers in Hyderabad, Warangal, Karimnagar, AP, Visakhapatnam, Kakinada, Vijayawada, Guntur and Tirupati. So, candidates can apply through the website. Eligibility Criteria: Students who have secured grade A+ or >=80% marks in Mathematics in previous academic year (2016-17) in any board examination are eligible. a) Junior Level: Students who are presently studying Class IX or X (2017-18). b) Senior Level: Students who are presently studying Class XI or XII or Degree 1st Year (2017-18). At each level, top 3 students will be given C R Rao and C. Bhargavi Rao Prizes of Rs. 10000, Rs. 7000 and Rs. 5000 on 29thJune 2018 during Twelfth Statistics Day celebrations at C R Rao AIMSCS, Hyderabad. Also, top performers up to a maximum of 15 students in each level will be awarded merit certificates during the same function. Since the test is in the nature of a talent competition, no special knowledge of any particular syllabus is required. The test questions would not be primarily of any syllabus oriented but of a nature requiring insight, critical approach, logical thinking, the power of application of knowledge in solving problems and a general mathematical maturity and statistics appropriate at that level. 6. The question paper will be in English. Answer scripts will be supplied at the centres. Candidates will have to bring their own pen and instruments box etc. Calculators/Mobile Phones/Electronic Gadgets are not allowed. There will be 10 questions in short descriptive in nature and all the questions are to be answered. Registration fee is Rs.100/- (Hundred rupees only). b. Offline Mode: by taking DD of Rs: 100/- towards registration fee in favour of “Director, CR Rao AIMSCS” payable at “Hyderabad” and DD Number should be entered in the application form. The DD along with the application should be sent by Speed Post to The Director, CR Rao AIMSCS, University of Hyderabad Campus, Prof CR Rao Road, Gachibowli, Hyderabad – 500046 and by filling the online registration form available in our website http://www.crraoaimscs.org on or before 8th January 2018. The date of payment and bank details should be entered in the application form. The application without registration fee will not be entertained. Interested candidates are requested to apply by filling the online registration form available in our website http://www.crraoaimscs.org on or before 8th January 2018 midnight. Note: Candidate has to bring 2 (two) copies of the admit card photograph affixed, Xerox copy of the school identity card and Xerox copy of the marks memo displaying the marks obtained in the previous class studied during the academic year 2016-17. 1) HYDERABAD: C R RAO AIMSCS, University of Hyderabad Campus, Gachibowli, Hyderabad. 4) VISAKHAPATNAM: Sri Prakash Vidyaniketan, D.No. 50-19-9/1, Beside The HINDU Office, T.P.T. Colony, Visakhapatnam - 530 013. 5) VIJAYAWADA: V R Siddhartha Engineering College, Kanuru, Vijayawada. 6) TIRUPATI: Department of Statistics, S V Univeristy, Tirupathi - 517502. 8) KAKINADA: Aditya Degree College, Lakshmi Narayana Nagar, Kakinada - 533003. 10) PUNE: HoD, Statistics Dept., Modern College of Arts, Science & Commerce, Shivaji Nagar, Pune - 411005. 12) CHENNAI: Principal, PS Senior Secondary School, Alarmel Mangapuram, Mylapore, Chennai - 600004. 13) BANGALORE-1: ITI CBSE School, ITI Colony, Doorvaninagar, Banglore - 560016. 14) BANGALORE-2: Delhi Public School, Bangalore - North, Survey No.35/1A, Sathnur Village, Bagalur Post, Jalla Hobli, Bangalore 562149 . 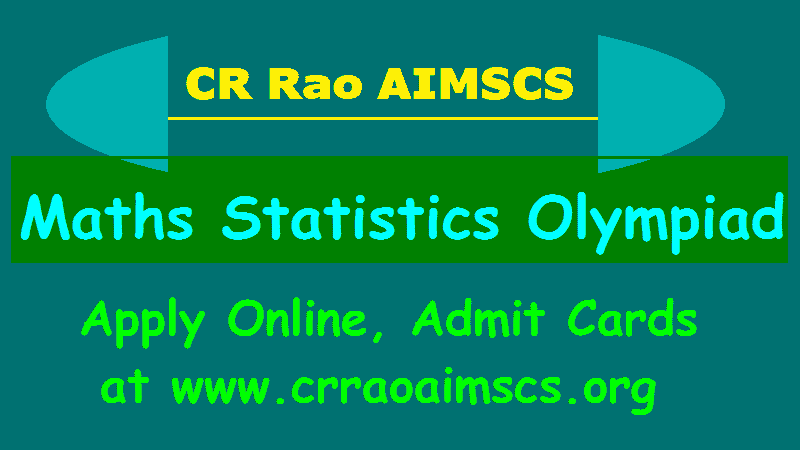 CR Rao AIMSCS Statistics Olympiad 2018, Statistics Olympiad Online application Form, Statistics Olympiad Admit Cards, Results would be available at www.crraoaimscs.org, Statistics Olympiad Talent Search Competition, Statistics Olympiad competition, Talent Search Maths Statistics Olympiad Competition, CR Rao Maths Statistics Olympiad, CR Rao Talent Search Olympiad. CR Rao AIMSCS Maths Statistics Olympiad Talent Search Competition Exam 2018 Apply Online, Admit Cards. For further details, for any queries you may please mail to "statistics.olympiad@crraoaimscs.res.in"